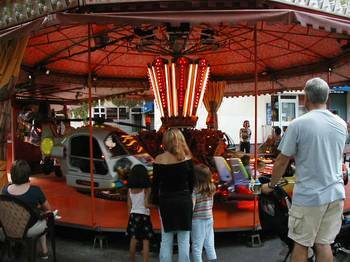 Carrousel on av. Emile Zola. The driver for the Airport Connection shuttle was darling. He was young, friendly, and contrary to the company's advertising, he did not speak English. But his will to communicate made up for it. One of our fellow shuttle passengers, Katie P. from Morgantown, WV, had a bad case of motion sickness. So, she shared the front seat with me and the driver. It was touching to see how concerned the driver was for her. Katie must be 18, going on 38. She and her boyfriend, who sat in the back of the van with Tom, are the kind of young people who can really talk with adults and enjoy it. They are going to have a great time in Europe because they are intelligent, open, and good conversationalists. 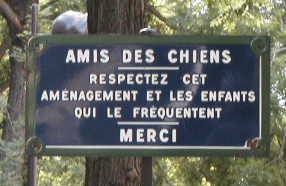 Near the carrousel is this sign urging "friends of dogs" to respect the area around the carrousel and the children who frequent it. On Thursday night, we ate dinner at Oh! 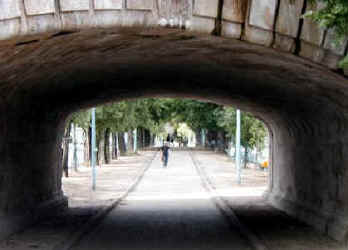 Duo (54 av. Emile Zola, phone 45-77-28-82), where we were instantly recognized and warmly greeted. Madame Valero gave us the best table in the house. Our friend Bob E. complained that I wrote too much about food in the journal in 2000 or 2001. But others told me they WANT to hear about food, so this year Bob is out of luck. He'll just have to skip over some parts of this. The food at Oh! Duo is fresh, elegant, and delightful to the senses. I had the salad with picodon (goat cheese), and filet de Cabillaud (cod), which came on a bed of cold, marinated, julienned vegetables. Very healthy food. The times are changing as well on the other side of the Atlantic. The U.S. Secretary of Commerce, Donald Evans, who met yesterday evening in Paris with is homologue Francis Mer, proudly sported a new French tie, of the Hermes label. At his side, and for encouraging this symbolic reprise in franco-american commercial exchanges, Francis Mer said he is about to buy "at the end of the week" a "beautiful American bicycle." A tie vs. a bicycle, the Americans are going to win again. 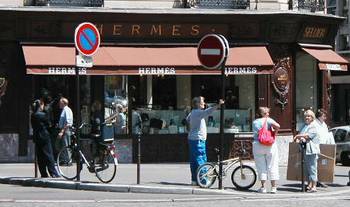 Hermes store in the fashionable 8th arrondisement. That afternoon, we walked up to the Champs Elysees and saw the massive train exhibition that lined both sides of the most famous avenue in the world. Train buffs were in ecstasy. On our way home, we stopped for dinner at Le Bistrot du Septieme (56 blvd. 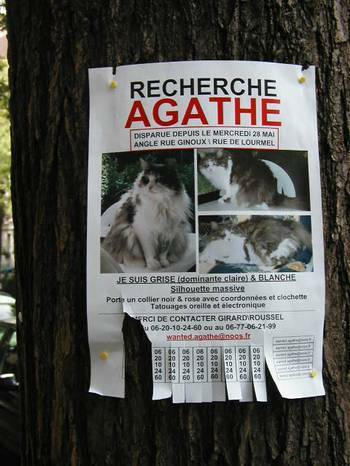 de la Tour Maubourg, 45-51-93-08). We did not have a reservation, for which we apologized, and they quickly put us at ease saying that it was no problem at all. Even though we were speaking French, they spoke English to us. No hesitation. This was different, we thought. We continued to speak French anyway, and they continued to speak to us in English. They were going out of their way to make us feel at home. 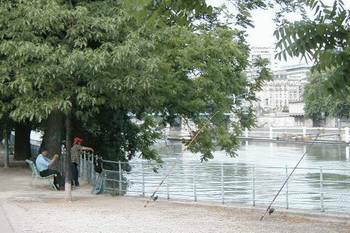 Saturday evening, we walked to the Seine and along the Isle aux Cygnes, one of our favorite evening excursions. 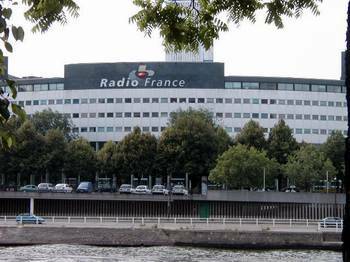 We could have gone to a jazz concert at the Radio France building on the other side of the river, but we decided that we preferred to be outside, rambling about. 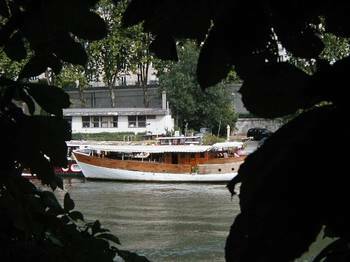 House boat on the Seine, seen from the Isle aux Cygnes. We'd made a reservation at Le Tire Bouchon (62 rue des Entrepreneurs, 40-59-09-27) because it is perhaps our favorite restaurant in Paris and because Sunday was our 14th anniversary. Isabelle Floury, co-proprietor of this fine resto, greeted us very warmly, recognizing us instantly, and speaking English without hesitation. All this friendliness was wonderfully overwhelming. The chef, Laurent Floury, speaks no English but he made a point of coming to our table to welcome us as well. I had foie gras and then rabbit, of all things, at Le Tire Bouchon. It was wonderful - like chicken, but with more taste. Sauces were superb. The foie gras was in terrine form, with a layer of strawberries in the middle. Heavenly. 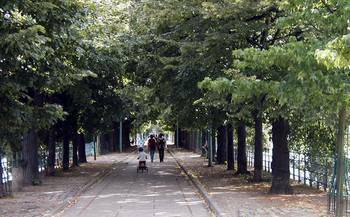 The pleasant walk along the Ile aux Cygnes. On Sunday evening, we found our way back to Le Petit Prince de Paris (12 rue de Lanneau, 43-54-77-26), after wandering about in Montmartre and then the St. Germain des Pres area. Again, we were greeted warmly and English was spoken to us even though we used our French. Something is going on. This is too much for coincidence. 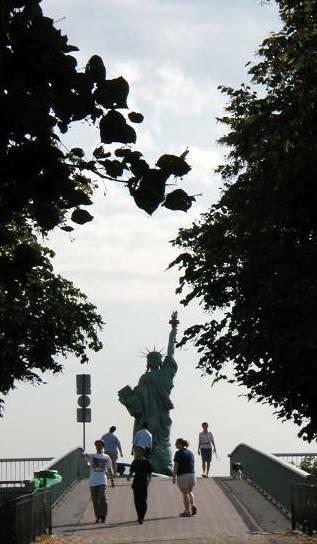 There is a concerted effort to make Americans feel welcome and wanted in this land. I have to stop writing now. There is a building on fire across the street from us. More later . . . the pompiers are arriving now. 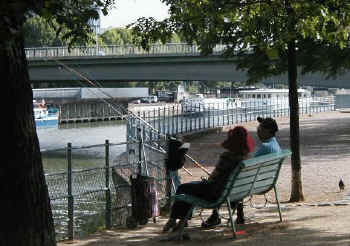 Japanese couple fishing from the Ile. 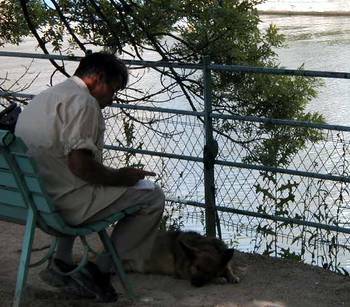 Man and dog relax on the Ile. 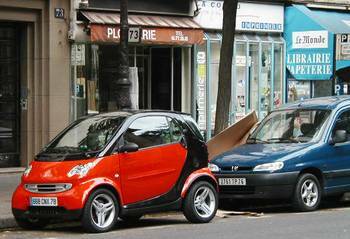 The eco-friendly Smart Cars are very popular in Paris. From Le Figaro on June 24: In mid-June, the 500,000th Smart City-Coupe left the Daimler Chrysler factory in Hambach (Moselle, FR). The tiny car has been produced since July 1998. In 2002, 122,300 of them were sold.